This race turned into a two horse race between Victoria and NSW with Victoria narrowly taking the Championship by 0.52 seconds. This was the 10th Championship in succession for the Victorians. Alistair McLachlan led through the 500 metres with Rhett Ayliffe and Anthony Edwards in close pursuit. These three scullers then swapped the lead at various stages down the race with Edwards in the the lead at the 1000 metre mark and McLachlan leading at the 1500 metre mark. However over the last 500 metres Ayliffe and Edwards sprinted well to the line with Ayliffe taking the championship from Edwards and McLachlan in third place. It was a fine race between these scullers. Victoria led early and consolidated their lead throughout the race to win by 4.81 seconds to Queensland in second place. 4th VIC - Bow: Andrew Broadfoot, 2: Zac Russell, 3: Tom Skidmore, 4: R Jackson, 5: S Rees, 6: Tom Hodgson, 7: Nigel Sullivan, Str: Simon Gadsen, Cox: Paul Bietzel, Cch: Peter Somerville, Emerg: William Tait was selected but withdrew for illness on the day. 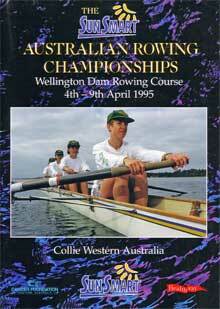 The NSW crew led from the start and were never seriously threatened winning by 5.45 seconds from WA then Queensland . An all the way win to Victoria with a good race for second placing between SA and NSW. Another commanding and all the way win to Emmy Snook from WA. She faced a good challenge from Bronwyn Roye but never looked like faltering. NSW led all the way and improved their margin late in the race. This was a good race between SA, NSW and WA. SA led for the first half of the race with NSW taking the lead in the second half of the race.